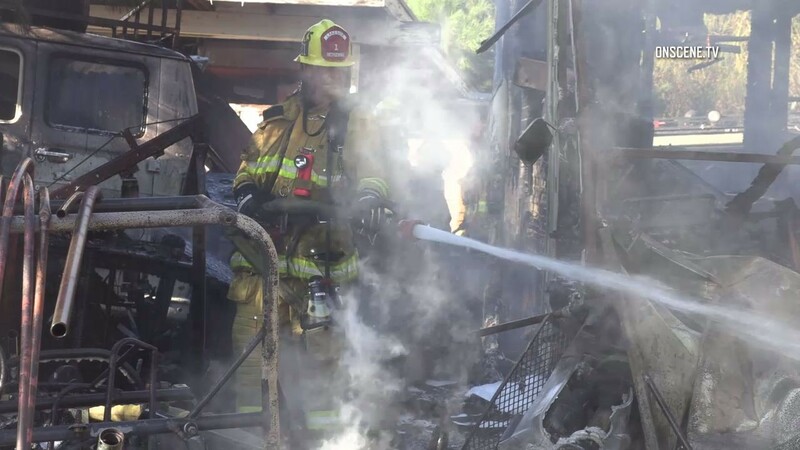 A rubbish fire that caused explosions and a large smoke plume visible in many parts of East County Thursday destroyed a motorhome and van in Lakeside, an official said. The blaze was reported shortly after 2 p.m. in the 10900 block of Fillbrook Drive, according to Lakeside Fire Protection Division Chief John Hisaw. When crews arrived on scene they found a lot of debris and copper piping in a driveway, as well as the motorhome and van, fully involved in flames, Hisaw said. Due to the large amount of brush in the surrounding area, Cal Fire and Santee Fire Department also responded to the scene. A fuel tank and a propane tank in the motorhome ignited, causing “quite a few explosions,” Hisaw said. Crews kept the blaze confined to the driveway, and residents of the property — including a cat — escaped without injury, Hisaw added.